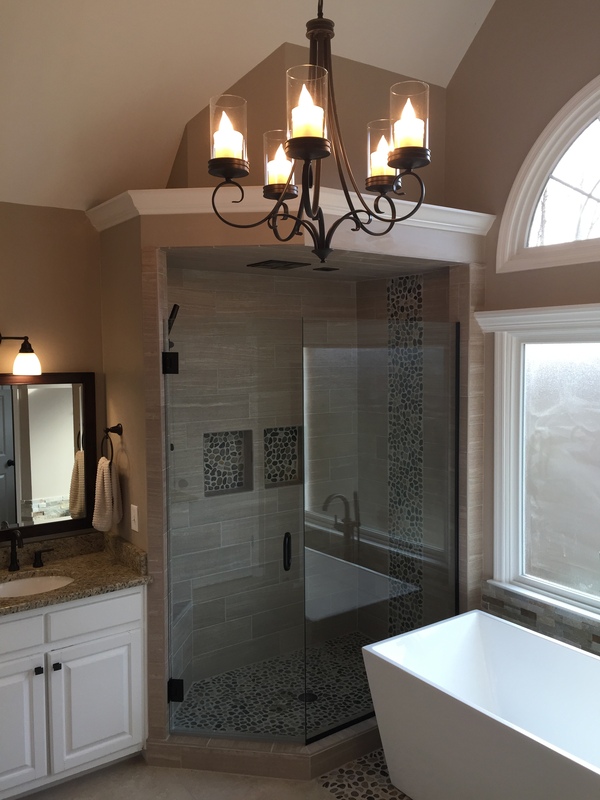 Exquisite Bathroom Remodel in East Cobb! This month on the blog we present our latest bathroom remodel project in East Cobb, Georgia we completed recently. We explore the ‘big picture’ and discuss the ‘pros and cons’ of medium sized renovations to a home. They found us through a neighbor that we had done work for. What made them choose Atlanta Curb Appeal? They had checked quotes from a few contractors and decided to go with us based on recommendations from their neighbor, plus our price and the design solutions I gave them. Was there a significant amount of demolition? How many days for each stage? The demolition required two days and the overall project was completed in 2 weeks. Tell us more about the Quad-Head Shower. Did the customers pick this one? 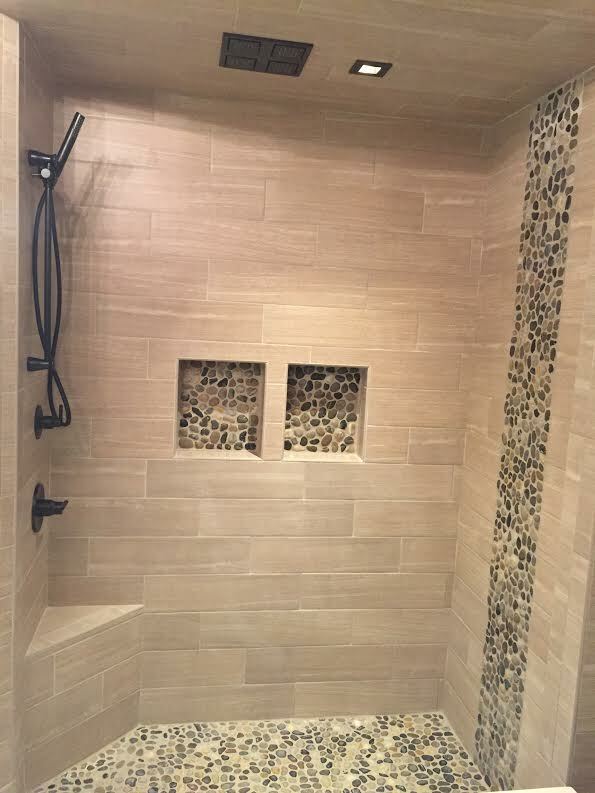 What are the benefits of this type of shower? The clients selected all the plumbing fixtures themselves. We have been seeing the Quad-Head Showerhead more and more recently. It is much more complicated than standard head installations. There is a whole new system of small pipes that needs to be created above each showerhead. People select these modern showerheads because they are looking for an amazing rainfall shower experience. How happy are the clients with the final project? They are very happy! In fact everyday (after the demolition stage) when they got home from work, they would express their amazement on our daily progress plus the clean meticulous work of our crew. 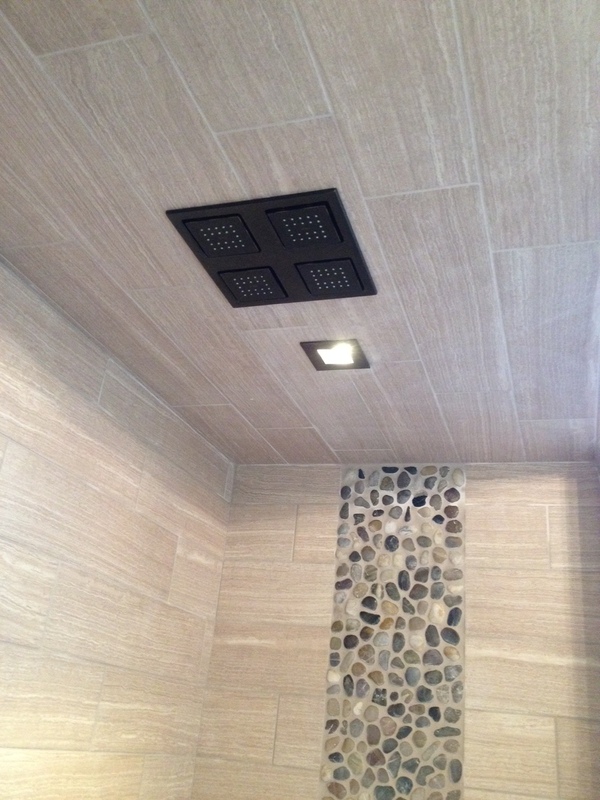 We consulted on the structure and layout of the shower and the client selected the tile. We recommended the location of the bench and soap niche. And how the tile should work best on these walls. What were your favorite parts of their bathroom upgrade? 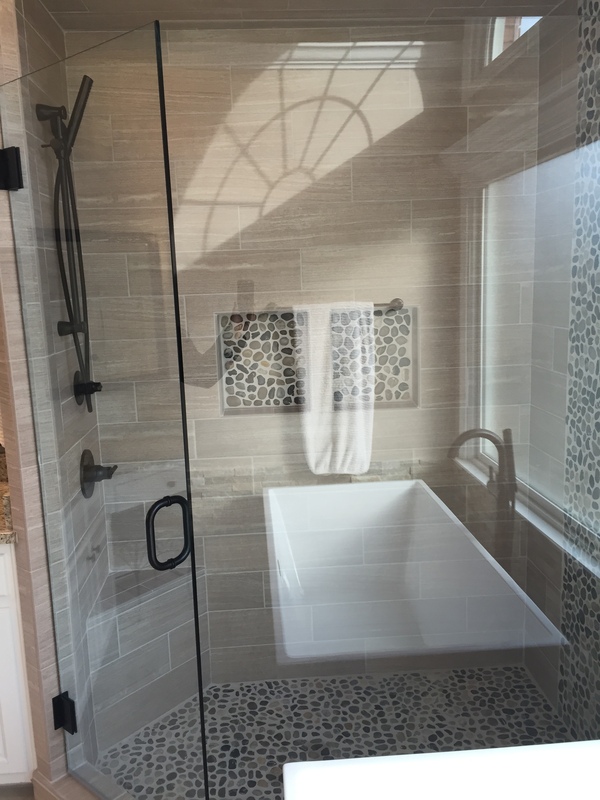 The shower tile, the fixtures and the stunning free standing tub. The pebbled floor is great too! 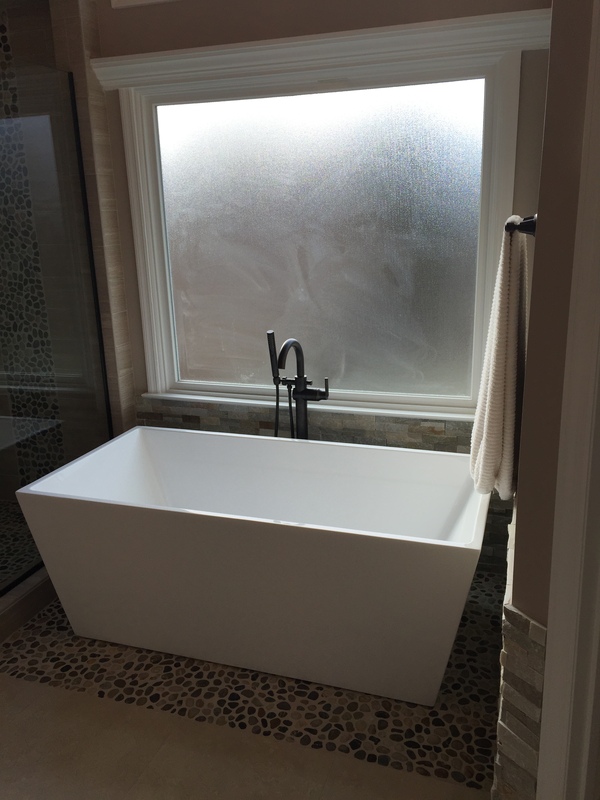 What would you like to convey to people who are thinking about a bathroom renovation? What is the big picture that customers should take into consideration? Which walls needs to stay or go? Where do you prefer your new fixtures to be located? What materials do you want included? Do you want a soap niche? How about a custom shower bench? What about special instructions? Do you have a preference on the heights of the faucets or mirrors? Each step is connected so the sooner we know the design, the better we can prepare for each stage of electrical and plumbing and the placement of the final product. This is critical before we close the walls back up. Another thing we like clients to keep in mind is that after demolition, things may look different to you and alternative ideas may spring up! Flexibility is important because occasionally you may find out what you wanted to do is not possible after all because of how a joist is running or the way a support structure is lined up internally behind the wall. Everything is possible of course, but sometimes the cost of shifting things around does not make financial sense. Modern and complicated plumbing fixtures are beautiful to the eye and can sometimes save money in the long run with their increased efficiency. Yet sometimes they do not come packaged with all the other parts required for installation. Additional costs might be needed to get these fixtures up and running. Renovating any part of your home is an undertaking and we encourage clients to be patient and to trust the process. Have confidence that everything will be elegant and beautiful in the end! We follow the same containment procedures with each job, which is first to cover the floors and separate areas with sealed nylon and zippered entrances then at the end of each day we clean up after ourselves. Then every new morning we set up covers again. Note, there will be dust in some areas though, areas you are not used to having dust before, but this is simply part of remodeling. We sincerely do our best to keep it as clean as possible at each stage. We hope we have been able to thoroughly explain the renovation process from the point of view of the homeowner. If you are considering a new bathroom renovation please check out Atlanta Curb Appeal’s numerous detailed online reviews and contact us for a free estimate at 770-778-1172. 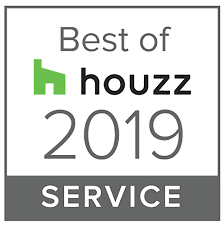 Avi Moyal, owner of Atlanta Curb Appeal, general remodeling and projects in East Cobb and Sandy Springs including Bathrooms, Porticos, Pergolas, Fences and more.